The screenshot you're looking at is for the video game adaptation of Donald X. Vaccarino's wildly popular card game Dominion running on iOS. And Android. And Facebook, Google+, Chrome, Safari — anywhere HTML 5 can be used, this game can be played, online and off. Using HTML 5 as a universal gaming platform is not a new idea; it's just a relatively wild and untested one. Founded by a team of platform and game industry veterans, Goko is looking to tame that wild frontier by creating a platform for developers to launch multiplayer social games playable across any and all HTML 5 supporting social networks, browsers and devices. The idea behind platform-free gaming is an incredibly compelling one. As Goko CEO and co-founder Ted Griggs puts it, "If I want to play with someone they shouldn't have to go out and buy the platform I'm playing on. I should be able to say 'Have you played this game?' and they should be able to play." Starting today, everyone will be able to play Dominion Online at Goko.com. Even though the native iOS and Android versions won't be out for a few months, the game will run on browsers on those devices. In fact, during a test earlier this year at the Game Developers Conference, 70 percent of the people that played the game on the iPad couldn't tell the difference between the browser game and a full iOS app. One game won't convert the masses into HTML 5 gamers, however. That's why Goko has 150 popular board and card games in the works. 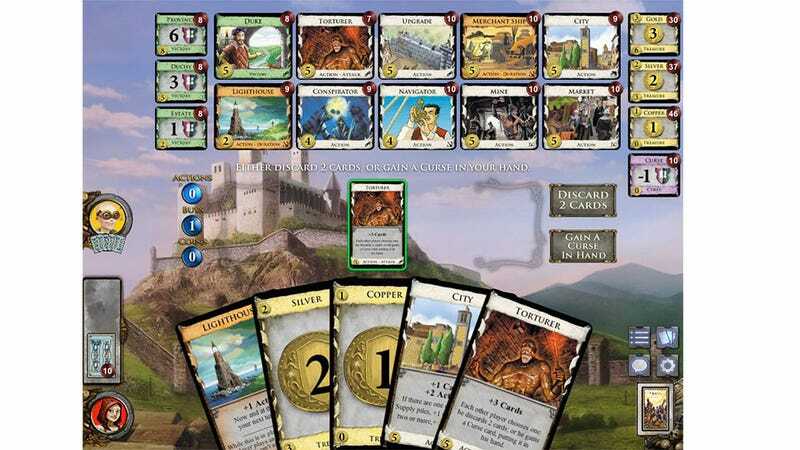 Launching today with Dominion Online is a beta for Catan World, a persistent take on Mayfair Games' Settlers of Catan. They've got Rio Grande Games' Race for the Galaxy in the works. Fantasy Flight Games is on board for Citadels. All the Kings Men, Forbidden City — Goko has teamed up with developers around the globe to bring these games to life. Goko is more than just games, however. It's a platform that will help facilitate smaller developers' entry into the market, allowing them to focus on making great games for a broad audience without worrying about the business and back end. "Only the biggest games companies have had tools for creating and launching social games across all the big platforms. Now we're bringing that massive advantage within reach of all developers," said Goko CEO Ted Griggs. "Today we're starting to release new games across Facebook, Google+, and Goko.com, Windows Store, Android and iOS. And we're also turning all of the tools and services that we've created over to developers so that they are empowered to do the same thing." Goko will handle features like in-game stores, digital object systems, economy management — the services developers don't want to, can't, or simply don't have time to screw with. Along with the first games, Goko is also releasing its SDK to developers today, opening up the world of platform-free games to independent developers everywhere. Goko could very well be leading the charge into a new era of gaming, where we stop worrying about what we're playing on and simply play. And if not? Gamers still get video game versions of at least 150 classics board and card games. I've played Dominion Online, and it's just damn lovely. You can play it now as well, and then keep playing it no matter what HTML 5 delivery device you find within arm's reach.